Feel like you have too many things to keep track of? A flow chart can help set you straight. Typically, you uses boxes or shapes to represent different steps in a process, and then you connect those steps with lines or arrows. Flow charts are perfect for including in project plans, business reports, presentations and white papers. Really, anywhere you need to simplify and communicate a process. But making a flow chart from scratch can seem like an overwhelming task. After all, you’ve probably come across some bad flow charts before. Set people on the right track. That’s why it’s a good idea to start with a flow chart template. 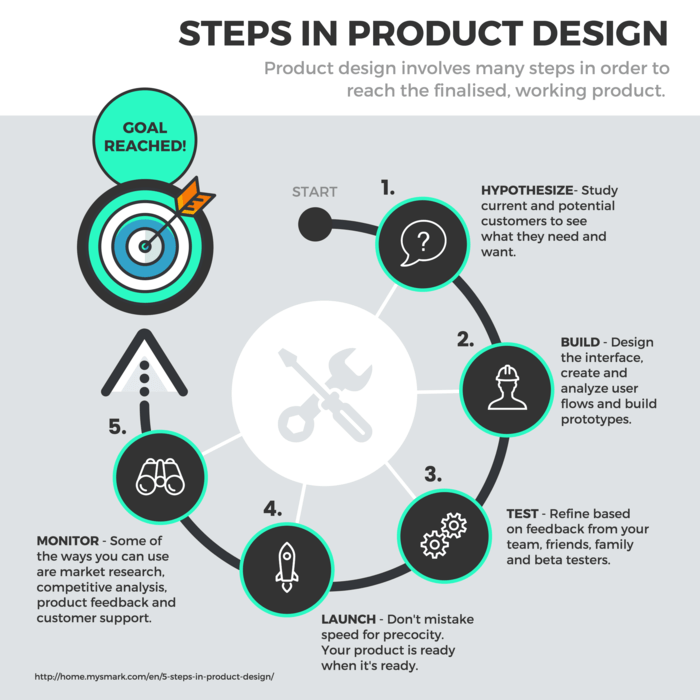 Plan your flow chart before you begin designing. How many steps will it have? How complex do you want it to be? Scroll through this post and pick a flow chart template that fits the process you want to visualize. Click “Create” to enter our flow chart maker. 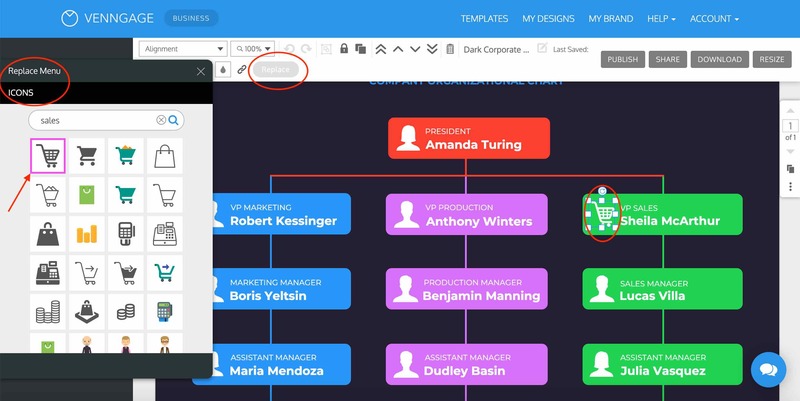 Add, remove, or rearrange points in the flow using Venngage’s drag and drop canvas. 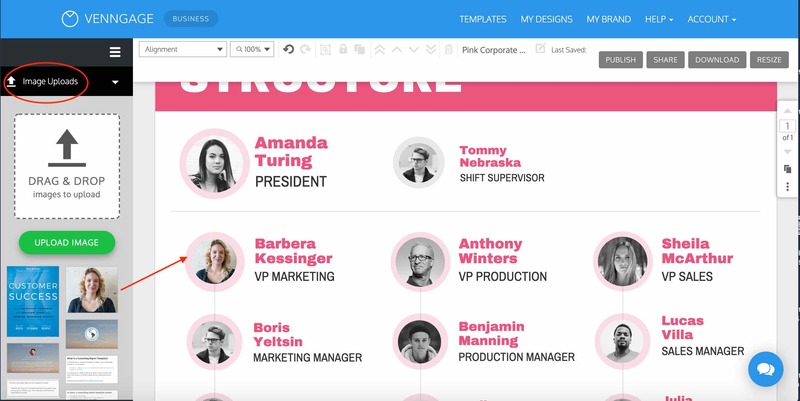 Even design newbies can use our tool. Insert your own dates and events using the text boxes. 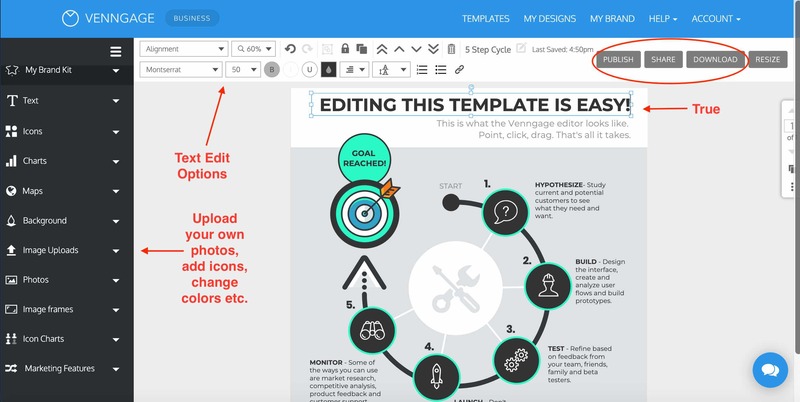 Customize the colors, fonts and icons to make the design your own. We’ll give you tips on exactly how to do this below. All done? 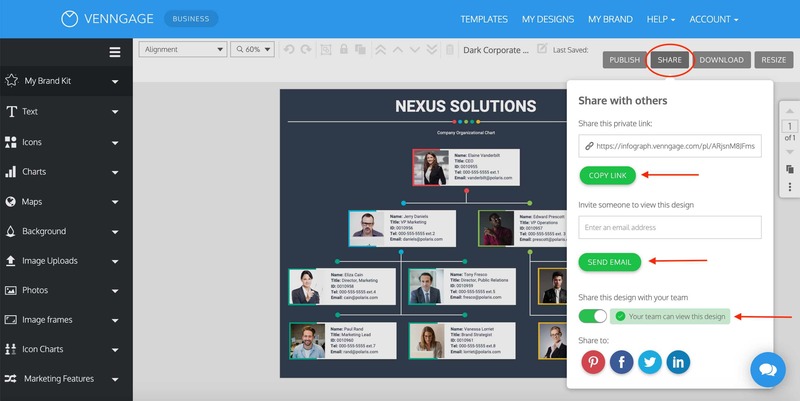 Easily share your flow chart via email or upgrade to download it. 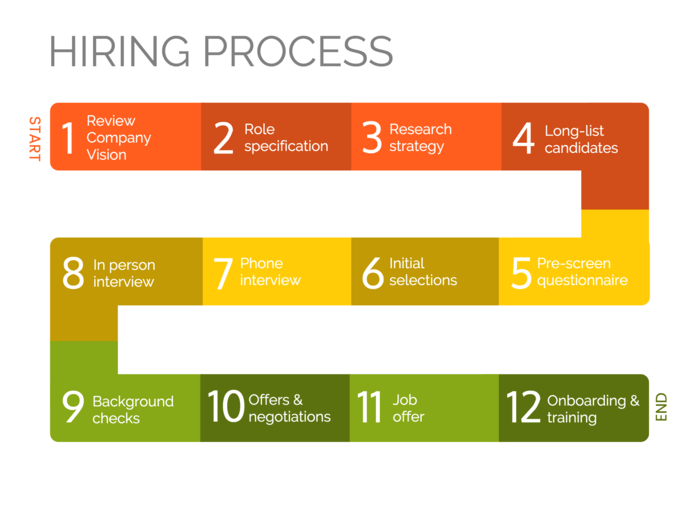 Here are 20 flow chart template, design tips, and examples to get you started. One of the ways you can use a flow chart is to break down part of a whole. This could mean breaking down a concept into components, like breaking down the factors that contribute to a business goal. Or breaking down a larger topic subcategories, like different facets of digital marketing. 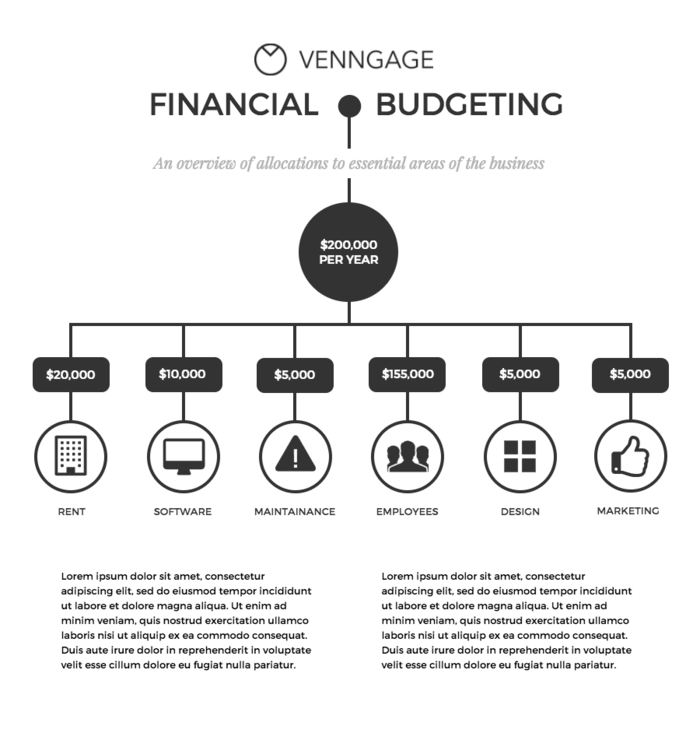 The chart above starts with the total budget and then breaks it down into smaller parts, using icons to represent each area. 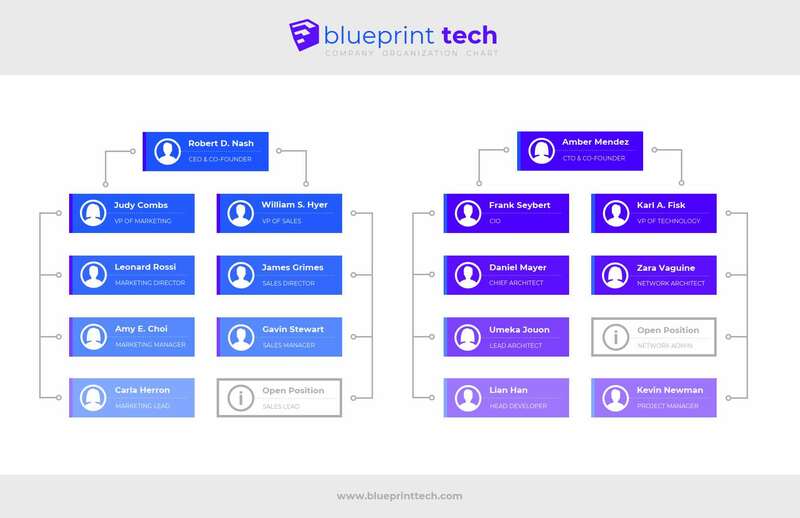 A corporate org chart is another classic use of a flow chart. Not overburden your chart with too many components, or it may become hard to read. Consider using icons to emphasize and differentiate between points. Include a caption or brief description, when more clarification is necessary. Do you want to visualize two processes that work in tandem with each other? To help readers better understand both processes, you may want to create a flow chart that visualizes both. The key for combining two flows is to keep the charts simple. 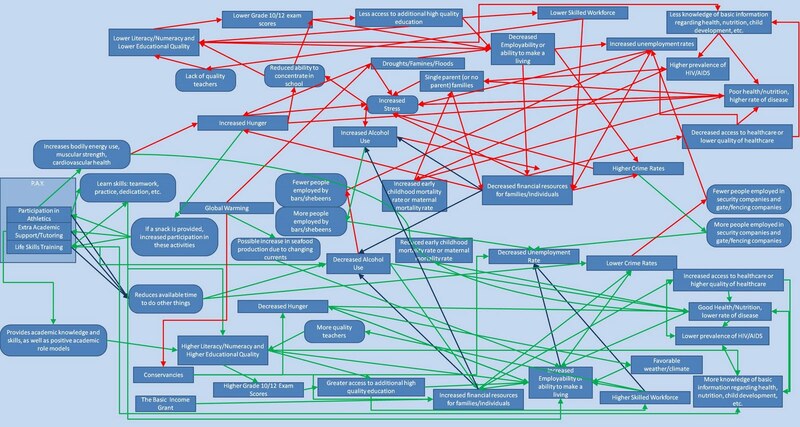 If you try to incorporate too many parts, your flow chart will quickly become cluttered. Notice how the circles are in bright colors, so they contrast with the more neutral rectangles. This makes the chart easier to read. Keep the flow charts simple, and don’t include too many points. Use color and shapes to differentiate between the two flows. Provide a clear title and if you think it’s necessary, a brief description of the chart. Differentiate between types of information. Give your flow chart personality. For example, you could use colors to differentiate between different stages in a process. Not only can the colors help readers remember the information, it can also make your flow chart easier to scan. A gradient effect helps differentiate the most senior and junior positions. 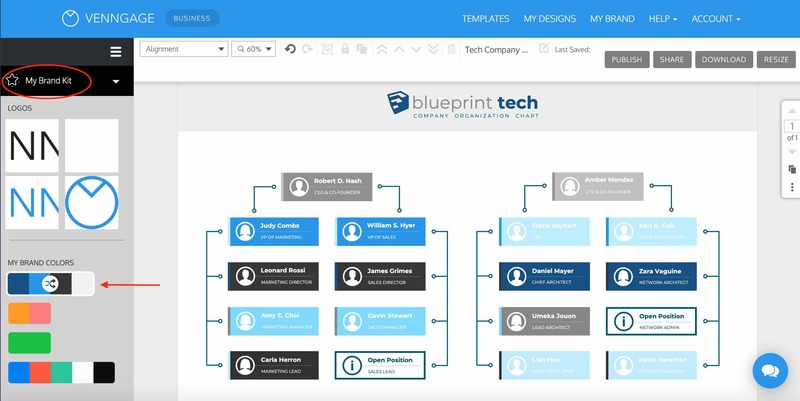 Pro Tip: Brand your flow chart template with one click using our My Brand Kit tool. The example below shows how you can open our My Brand Kit tab and click your color palette to apply it to the entire template. You can pull your brand colors from your website or set them manually–up to you! 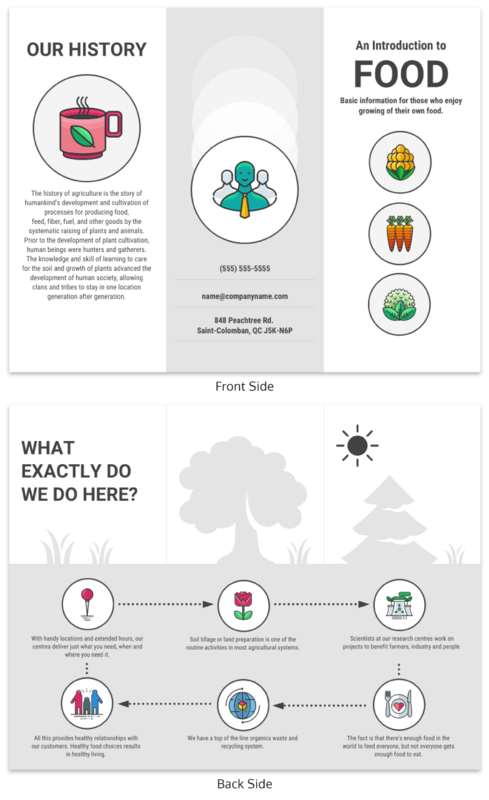 This is useful for consultants and freelancers who quickly want to add a client’s branding to their document. 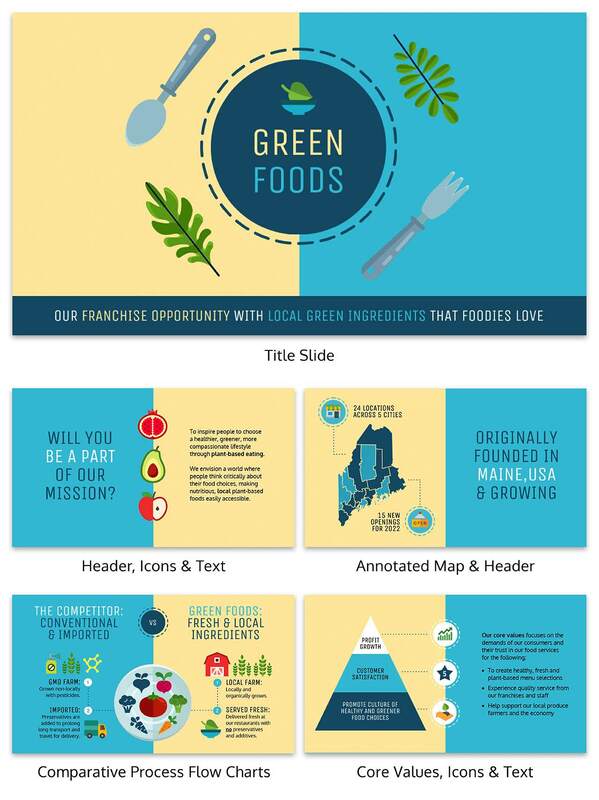 Use contrasting and complementary colors to highlight information. 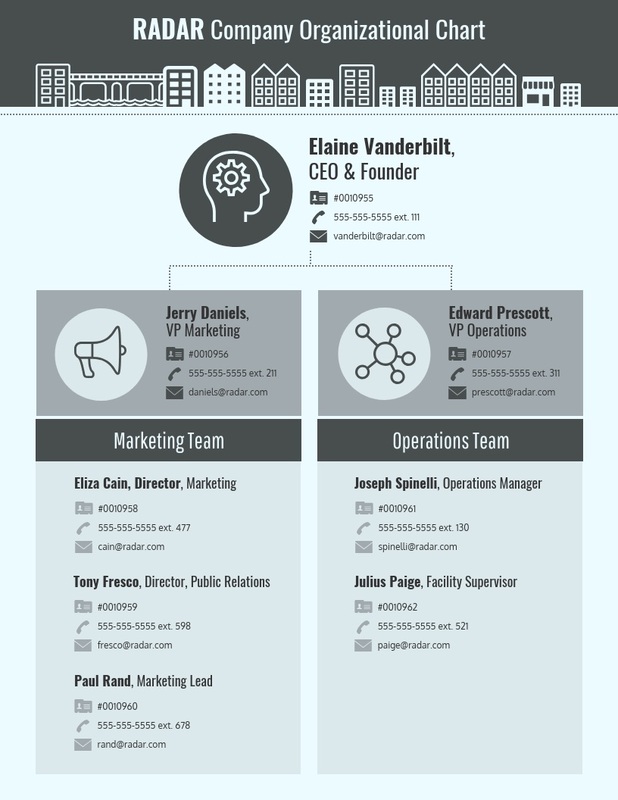 Add a single color to a black and white design to highlight a single piece of information. Pick colors that reflect the mood or theme of your information. Read our guide on how to pick brand colors for more tips. Icons are another design element that you can use to make your information more memorable. You can use icons to emphasize points and to illustrate concepts. 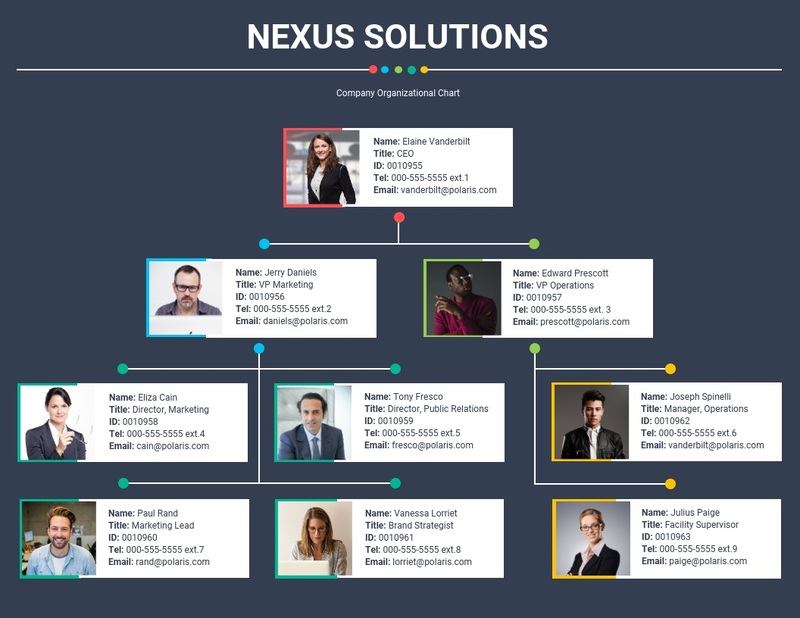 This simple org chart uses gendered icons.You could replace them with icons suited to their role, such as a shaking hands icon for a partnerships manager. Pro Tip: Once in the Venngage editor, click any icon in your flow chart template and then click “Replace” to change it. Our icon library with thousands of professional icons will open. Search by keyword. In the below example, I searched for “sales” to find the right icon to represent a VP of Sales in an org chart. The tool inserted (and resized) a shopping cart icon for me. Pick icons that are the same style (same line width, flat or illustrated, filled or line art, etc.). Make sure your icons are consistently sized, to prevent your design from looking cluttered. Don’t use icons to replace text unless the meaning is very well known (for example, a stop sign). 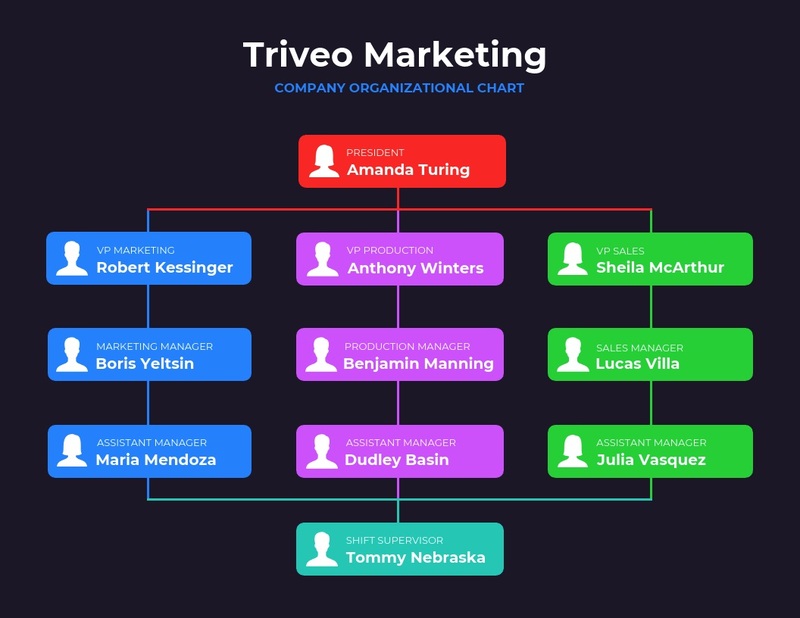 This is especially effective to personalize corporate org charts or customer journey maps (see next section below). Charts and infographics are the perfect formats for telling stories with your data. They allow you to illustrate concepts and events using engaging visuals. 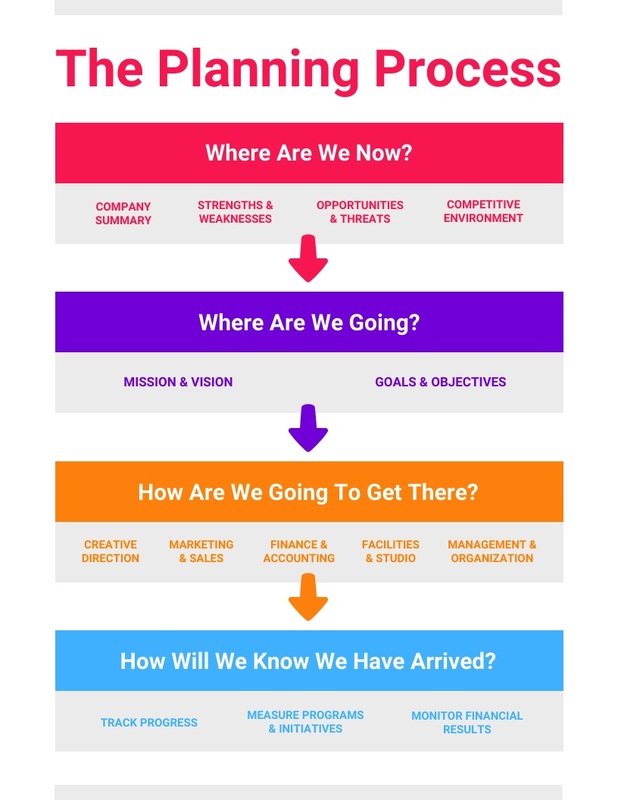 One of the most popular uses of a flow chart is to illustrate a business’ customer journey. 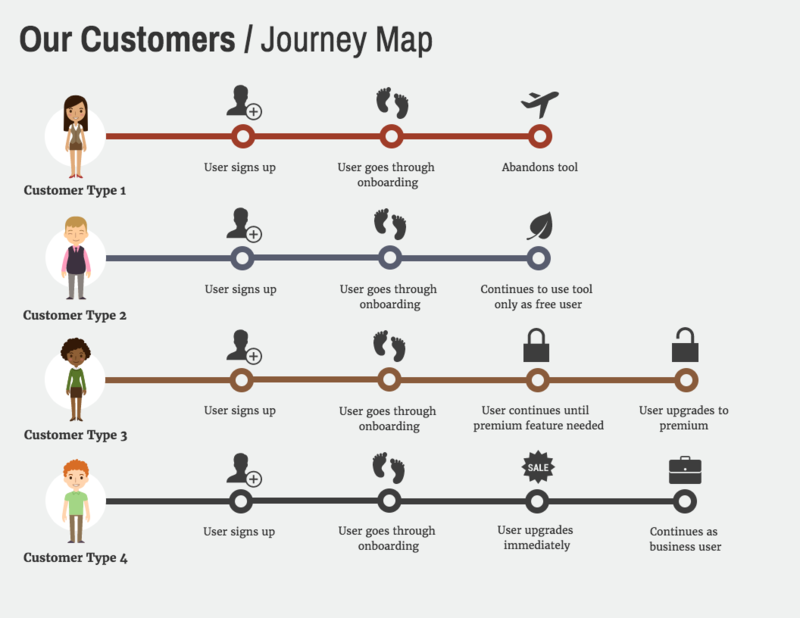 While customer journey maps can be quite simple, more businesses are creating engaging visuals to tell their customers’ stories. 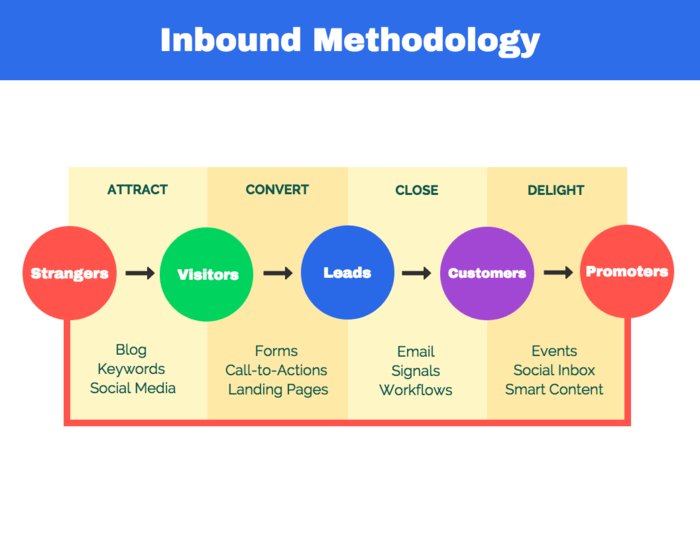 Icons, bold colors, and elegant fonts can all be used to make your customer journey map interesting to read, while still maintaining a professional look. Use directional cues like arrows to guide how people read your chart. Use icons to illustrate the steps or stages in your process. If you’re showing more than one customer persona’s journey, use different colors and illustrations to identify their respective paths. Flow charts don’t have to just visualize boring business processes. They can also be a fun way to engage your audience on social media! You could create a flow chart that doubles as a quiz, like this flow chart we made that tells you what your whiskey personality is. 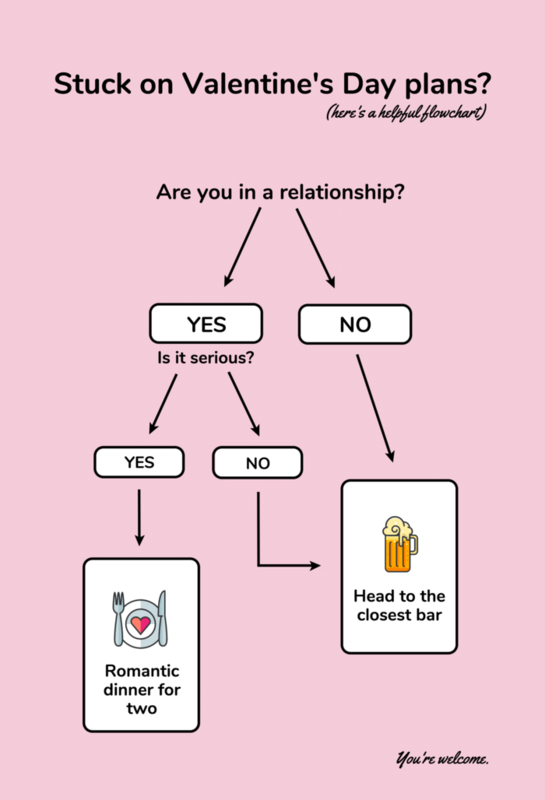 Or take this super helpful flow chart that helps you come up with plans for Valentine’s Day. You could also customize the above flow chart template for a special sale or promotion. 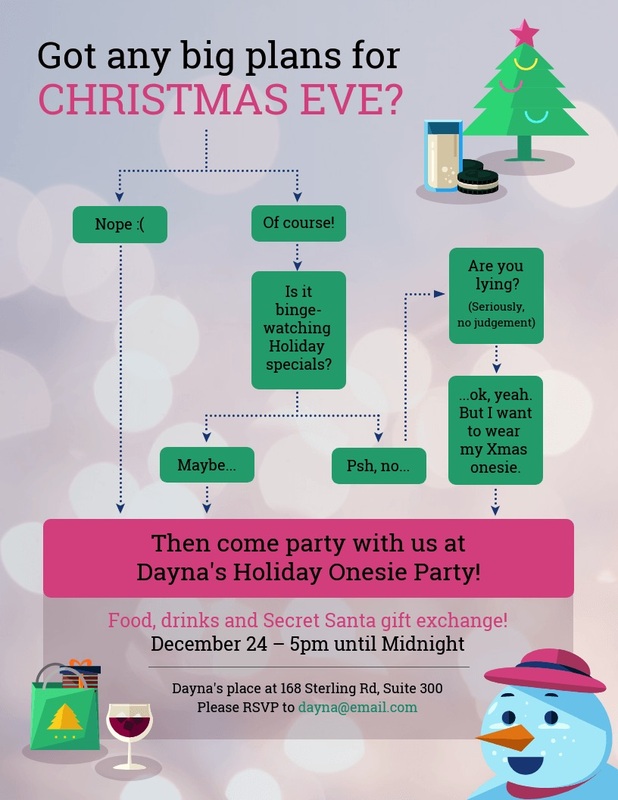 Do you have an office Christmas party coming up? Do you own a dress that’s half decent? You need to shop our 30 percent off holiday sale! Keep your chart very simple, so people will be able to read it easily. Use the optimal image dimensions for each social media platform. Pick a bright, bold color scheme that will stand out from newsfeeds. If you want to help people make a decision, a flow chart is a great way to visualize two options or paths people can take. You could show how the two paths diverge from the same starting points, or you could place two flow charts side by side. Show parallel options or stages in process by placing them level with each other on the page. Use colors and icons to differentiate between the two paths. Use a brighter color to emphasize a path you would like readers to follow (for example, if you’re showing two service plan options). A flow chart doesn’t have to stand on its own. 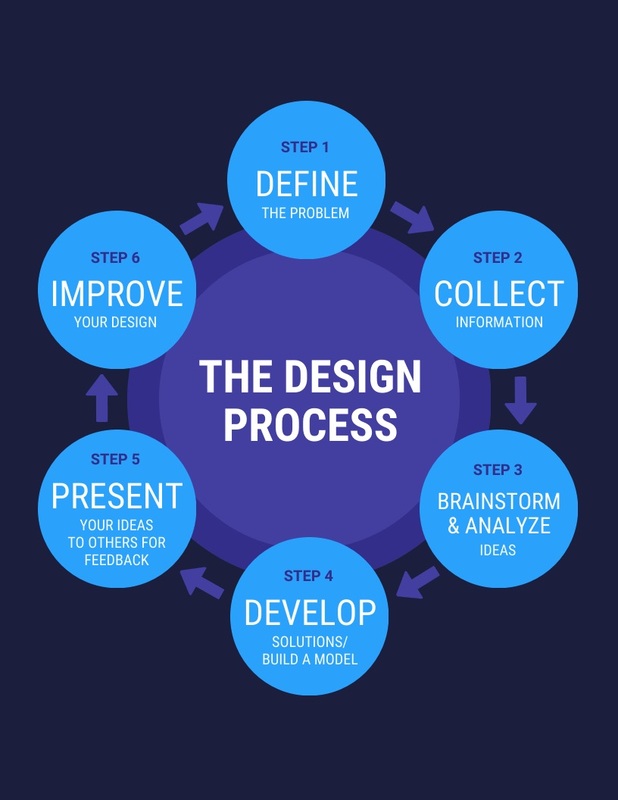 If you’re creating an infographic that covers more information, you can incorporate a small flow chart into your design. It’s generally a good idea to only visualize a short process or a simple concept. Information that requires more detail would probably require its own infographic or chart. Keep your flow chart brief and focused on one concept. Clearly title the flow chart section so readers understand it. 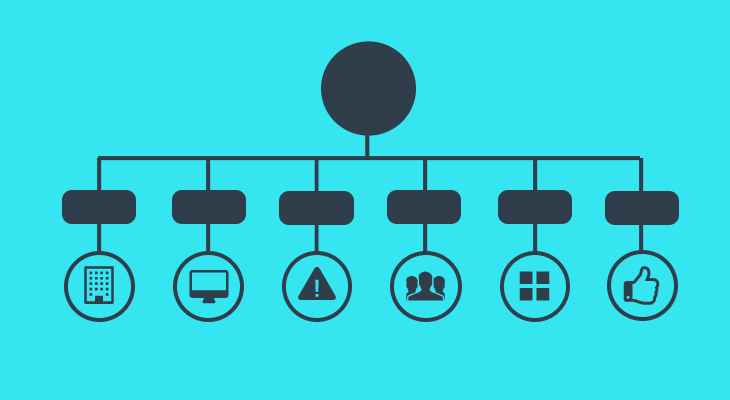 Flow charts aren’t just visuals that explain processes to others. They can also be useful tools to help you plan and prioritize projects, strategies and experiments. Identify the key metric or goal you want to impact and the experiment you want to run to impact that goal. Ask predictive questions about the value and resources of the experiment, to gage if it should be a priority. Use different colors to categorize the types of resources required, or the amount of effort required to run the experiment. Some processes don’t have a definite beginning or end and a flow chart is a great way to visualize that. Put the “starting point” in the top left corner of your flow chart. Use directional cues like arrows to indicate which direction the cycle moves in. Offer brief description of the flow chart for context.